This is a project that was a private commission from a husband to his wife. The rooms were a surprise gift and these types of personal projects are always a pleasure to create! He knew his wife wanted to start collecting miniatures and had always wanted a roombox she could dress and fill. The husband decided to commission 2 empty rooms she could play with and decorate herself. 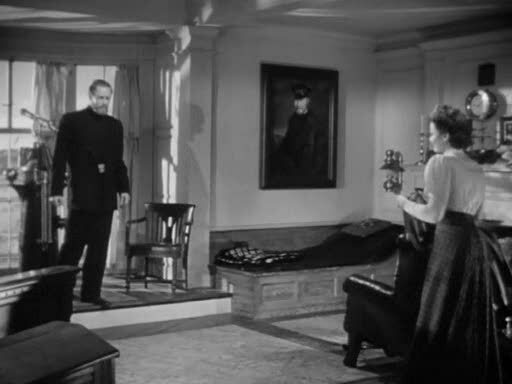 It was built in 1/12th or 1" scale (dollhouse scale) and consisted of two different room concepts. Please enjoy the pics and commentary. 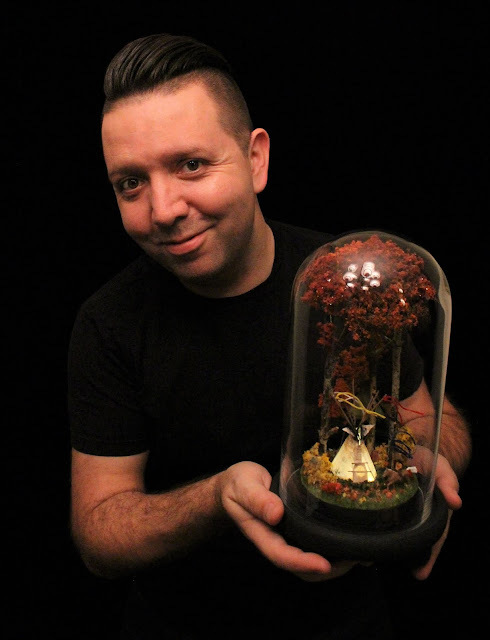 If you would like you own miniature, roombox or dollhouse built, send me a message! 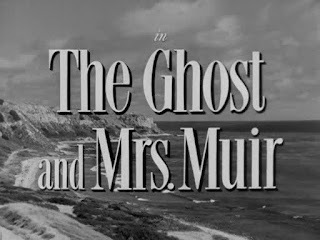 The first room was based on the 1940s B&W film, "The Ghost and Mrs. Muir" starring Gene Tierney and Rex Harrison. 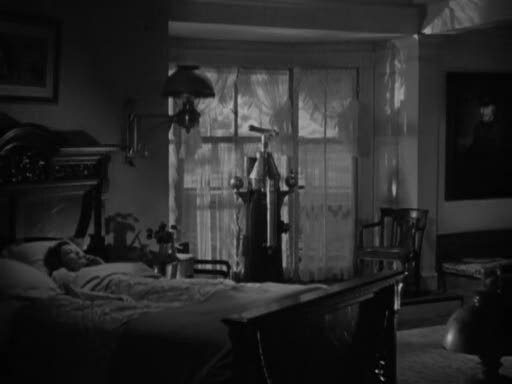 This was the famous bedroom scene with the balcony overlooking gull harbour. 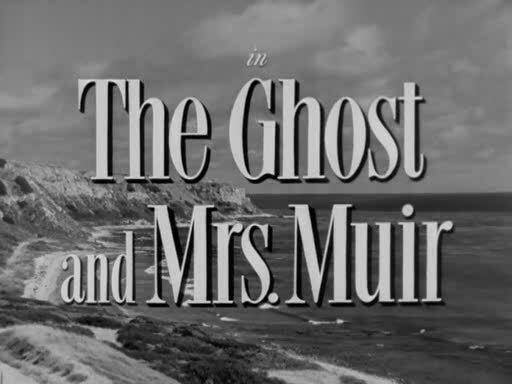 This is one of his wife's favorite films. 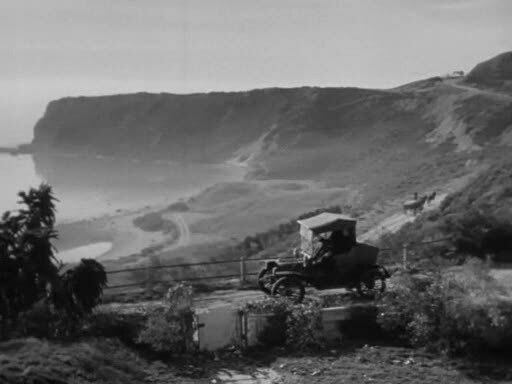 I have included some screen shots from the film for comparison. 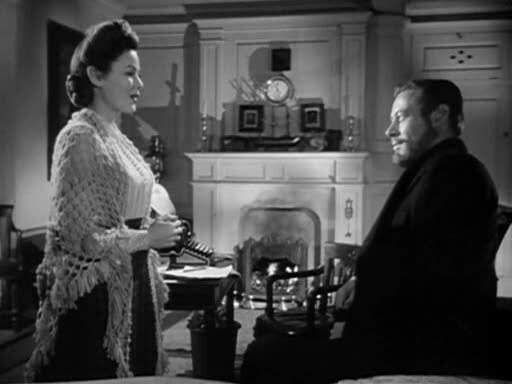 This is the main view from the film. The client wanted dark floors so i used a dark walnut wood stain. The walls are antique white. This wall is not seen in the film, but is necessary to complete the room. The fireplace embers light up and the lamps are powered as well. The trim work was hand done with little saws and blades. This painting is a custom replica of the painting in the film, a little extra gift for the mrs. from me. The mattress is moulded from Crayola Model Magic (No Surprise) and painted to look like leather. Looks great in natural light and also when lit at night. The railing was glued on to the backdrop image and the metal crosshatching was drawn on to the photo. The backdrop image here is a print out of a picture i took when I was in california visiting family. Im sure its the same beach!! Worked out perfectly. This is a gold painted radiator and one of two plugs I installed for accent lighting. Looks great with the lights on. Feels like an old Edwardian home.....perfect. 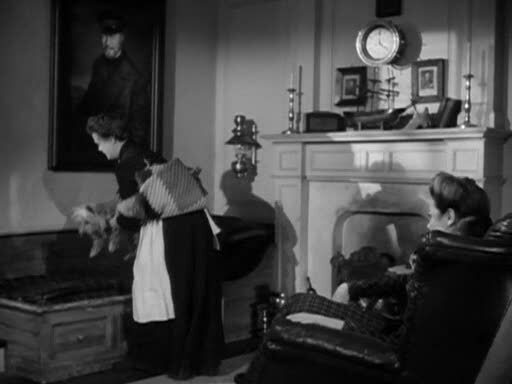 Makes you appreciate the lighting and set designers of the old film era. This mattress was sculpted using an empty pen casing and a flat blade. These boxes each have a removable plexi dust cover to keep things clean and out of little fingers. The lights in the outside of each box is on a seperate l.e.d. light strip, seperate from the practical lights . Low wattage and no heat at all. very safe. This is another picture of the california vacation I took...thought I would do the same type landscape on both. Lights on in the Library...ready for books and furniture!! Five bulb chandelier hangs over the entryway. That is it, please keep reading to find out the behind the scenes action!! Bits abd Bobs ready to become parts!! All these parts come from Ross's Miniature Treasure House in North Vancouver. Had to hold each piece in place till it was dry.......many hours. Gonzo come by to test the staircase for sturdiness. Brick backdrop for fireplace made from model magic. Day bed trim is old extension cord....I had to find something flexible. This curved area was hard to do, I had to soak the trim for days till it could bend, create a mold and let it dry curved. This is outdoor fencing I am going to use as the railings. I used gauche paint to paint it.. Built a little frame and put it into place. Here is the panel for the electrics. all hidden away and well organized. Thank you so much for checking this out. If you would like you own miniature, roombox or dollhouse built, send me a message and I would be happy to answer any questions you have! Special thanks to Mary Bin at Ross's Miniature Treasure House in North Vancouver, British Columbia,Canada for all her help and support.